I woke to the sounds of rustling nylon and plastic bags, the clanking of cook stoves and mess kits. Backpackers quietly took down their camps while talking in low polite voices. The cool air smelled of dirt and cedar wood chips. I crawled out of my tent and onto my feet, and then stretched my stiff spine. The night's veil lifted while I had slept. Granite cliffs and colossal pine trees surrounded me on all sides. There was no doubt, I was in Yosemite. The sun was still below the rim of the valley, but soon it blazed a bright cap on top of Glacier Point. The light gradually melted down its sides while I took down my tent. A backpacker at a neighboring site, and the source of much of the rousing morning sounds, saw I was awake and walked over. "You starting your trip or finishing it?” He was a skinny man with long thin hair. A two-week beard insulated half his face. He could have played the hippie guidance counselor in any high school sitcom. “Oh man, it was perfect. Upper forties, fifties,” he said. That was nice to hear, although I was prepared either way. I’ve learned from past mistakes. We talked a bit more, then he went back to help his wife take down their camp. When I got everything packed and hoisted onto my shoulders, I walked over to say goodbye. “You heading out?” he asked as I approached. “Yep. You wouldn’t happen to know the way to the permit office, would you?” I had no reason to rush. I didn’t even know what time it was. I just thought he could point me in the general direction. Mostly it gave me an excuse to walk over and say goodbye. One of the women I met on the shuttle last night overheard and walked over. “Yeah he came in with us after dark last night; he’s probably a little disoriented,” she said, but her eyes were saying, "Oh my, you’re already lost and going up there alone. He’s going to die for sure. That’s too bad, he seems nice." They both simply told me how to get to the nearest shuttle, but I wanted to walk and see the valley. I took their directions to get out of the campground, but veered off and went my own way. I wondered if she would be checking the newspapers for missing hiker reports. Next to the backpacker camp was the North Pines Campground. I passed RVs with satellite dishes, cluttered picnic tables with condiments from last night’s feasts. There were tents the size of small cabins, containing cots with thick mattresses. It reminded me of car camping before I went on my first backpacking trip. I enjoyed those trips too, but nowadays, if I can’t carry it on my back I'm better off without it. I wandered through the park and gawked at the two to three thousand foot peaks edging the valley floor, like a New York City tourist staring up at skyscrapers. I stopped on a bridge over Merced River and leaned over the railing. When your only goal for the day is to hike up five miles and setup a campsite, there is no rushing required. Before long I was jogging to board a parked shuttle that was loading passengers, my pack bouncing on my back like a tiny bull rider. I was in a maze of canvas cabins, shops, and parking lots and couldn’t find where I needed to go. I decided to just let a shuttle take me. Okay, so maybe the worried eyes on the woman back at camp were a little justified. The permit office opened moments before I arrived. A line had already formed that still had not moved after fifteen minutes. A park ranger came out of a back room and asked me where I was heading. He had long hair and leathery skin, I trusted that he had roughed it a few times in his life. “To the rockslides trailhead,” I said, and showed him my reservation and itinerary. “I heard the trail can be hard to find from that trailhead, so I thought I’d see if I could change my reservation to the Big Oak Flat Trailhead instead,” I said. “You could. So you going to hitch down there then?” he said. The first leg of my journey was no longer on any published maps, but I chose it for the chance of solitude; a rare commodity in Yosemite. He went to the back for a larger, more detailed map, and then unrolled it like blueprints on a table. “How far up is that?” I asked. He pointed to three on the map, recommending I carry a gallon to get me through the longest dry stretch. He went to the back to finish up the paperwork. “Sorry it took so long, the printers were down," he said, handing me my permit. "Do you have any other questions?” My instinct was to ask if I could take a look at his printer, but I fought the impulse. Years of IT work has made it a reflex. A sad, sad reflex. “Do you recommend a place to get breakfast?” I asked him instead. People often say things like “and they’re cheap” to me when making suggestions on something I might buy. This is probably normal for everyone, but sometimes I wonder if I give off a strong destitution vibe. I choose to believe he just thought I looked like a young penniless college student. I ordered two muffins; thick with meat, egg, and cheese. Knowing that I’ll burn far more calories than I’ll eat this week means I can eat whatever I want, in whatever quantities I want. And knowing that is a wonderful thing, maybe the best of things. It’s a kind of guiltless freedom that you only get a few times a year: Thanksgiving lunch, Christmas dinner, and the breakfast before hitting the trail. 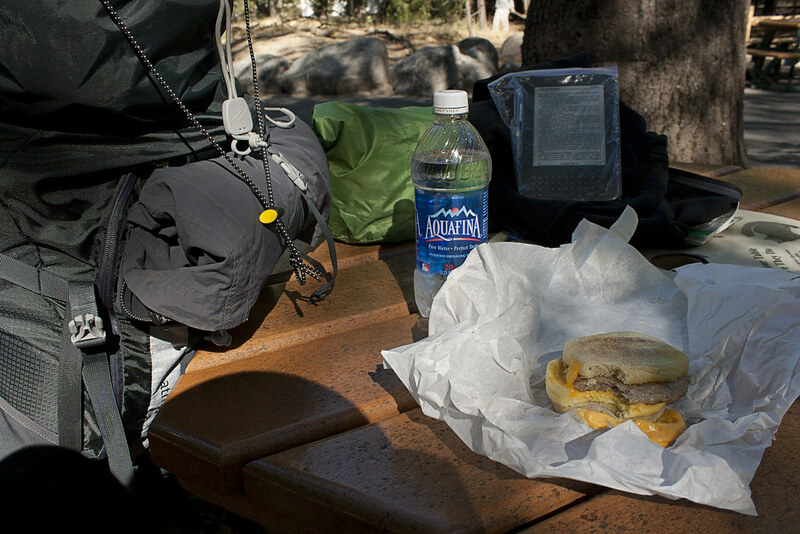 After eating, I went to the El Capitan shuttle stop to wait for my ride to the trailhead. “Where you headed?” said a woman with short blonde hair sitting on one of two benches. She seemed like the adventurous type. “First, to a trailhead near El Capitan, then to hike along the north rim.” I stood with my backpack on the other bench, riffling through it, reorganizing a few things. “We’re going to El Cap too. But just for the day, for a picnic,” she said while looking at a man joining us. His slacked face lacked the jovial spirit of the woman’s. He sat on the other side of my bench, sandwiching me between them. “Sort of, in the last few years anyway,” I went over the list of places I’ve been in the last four years: Grand Canyon, Zion, Bryce Canyon, Isle Royale, Olympic, Shenandoah, Rocky Mountain National Park, and North Manitou Island. “Where’s that? Where you live?” she asked. With my gear put away, I cinched up the straps and answered her. “That’s cool, so do you like, have a job?” she asked. The man she was with laughed at her question. “Yes,” I said. “I do get vacation time.” Again, penniless college student, destitute, or both? Just as I got everything secured, a shuttle came towards us. 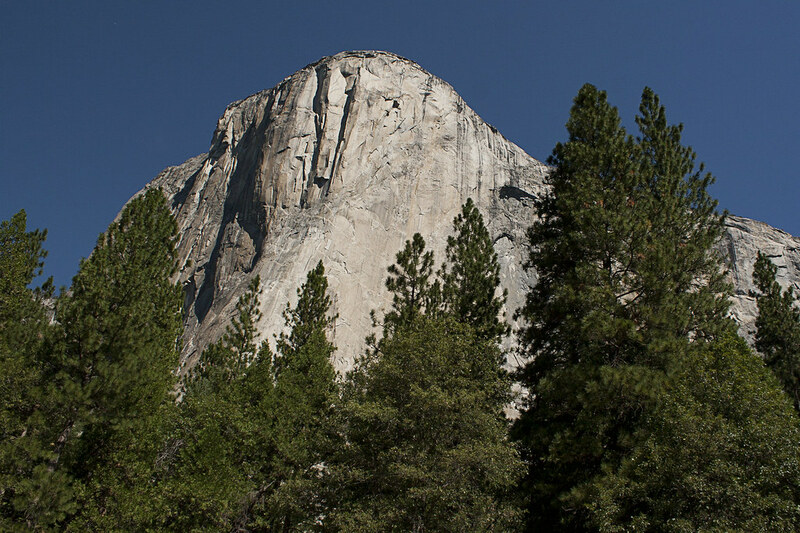 A sign in the front window said “El Cap”. Its brakes whistled and hissed to a stop and the doors folded open. We climbed aboard the empty shuttle and took our seats. “Good question,” I said. “I wonder that sometimes myself. I shouldn't say that, I'm sure Indiana is fine. I've just never tried living anywhere else." “You see any bears yet?” The man asked. “No, not yet. Not here anyway,” I said. “I’ve seen two out here actually,” she said. “We’re staying in North Pines. We saw a yearling bear cub go in there last night. I wonder if that was it! ?” she said. “Well, now we know two,” she said. The shuttle stopped and opened its doors. We gathered our things and said goodbye. They went toward the picnic area and I walked down the street looking for my trailhead. Parked cars crowded the roadside. 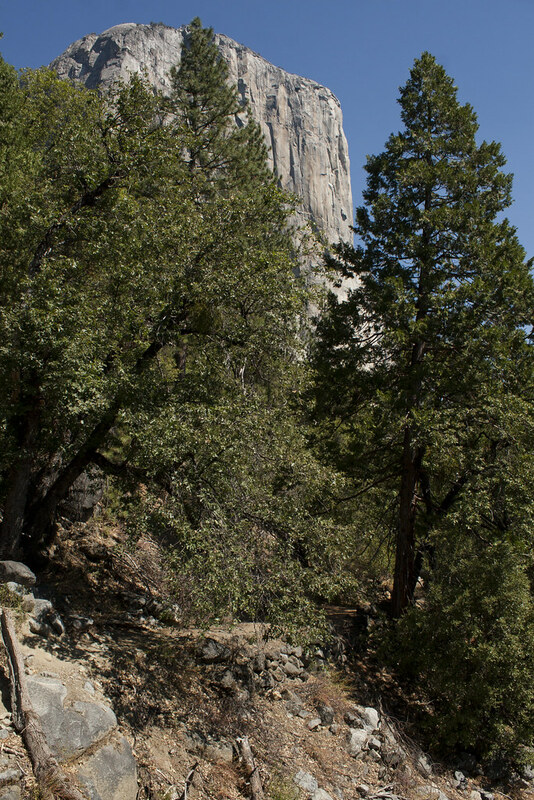 People were staring through binoculars and pointing at a broad-faced vertical rock formation called El Capitan. “There’s one,” a woman said while pointing. I followed her finger to a speck clinging to the side of the granite monolith hundreds of feet above the ground. It was a rock climber. I looked a couple thousand feet to its peak and thought, I’ll be sleeping up there tomorrow night. After some searching, I was relatively sure I found my trailhead. I confirmed it when pieces of paved road appeared through the dusty forest soil. It was the Old Big Oak Flat Road. 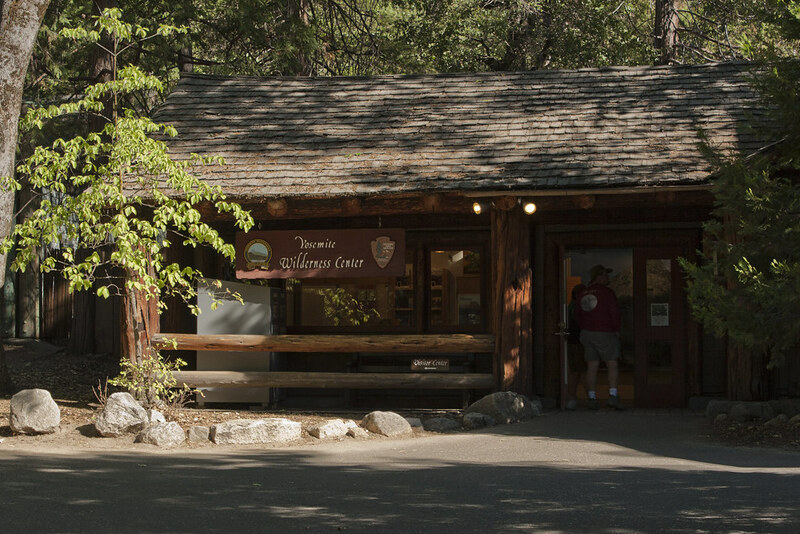 In 1868, local businessmen created the Chinese Camp and Yo Semite Turnpike Company to build a toll road from the Chinese Camp mining settlement to Yosemite Valley. Early travelers labored down the narrow road over inches of granite dust, around sharp curving switchbacks, and along dizzying cliff edges. The road was so treacherous that not only were early travelers encouraged to bring extra parts for their vehicles (drive shafts, springs, wheels, etc. ), but several died on their trip into the valley. As it turns out, I’m not the only one that believes the scenery here is worth a slight risk. Besides, I managed to survive half of the most dangerous part of the trip: the planes, trains, and automobiles. 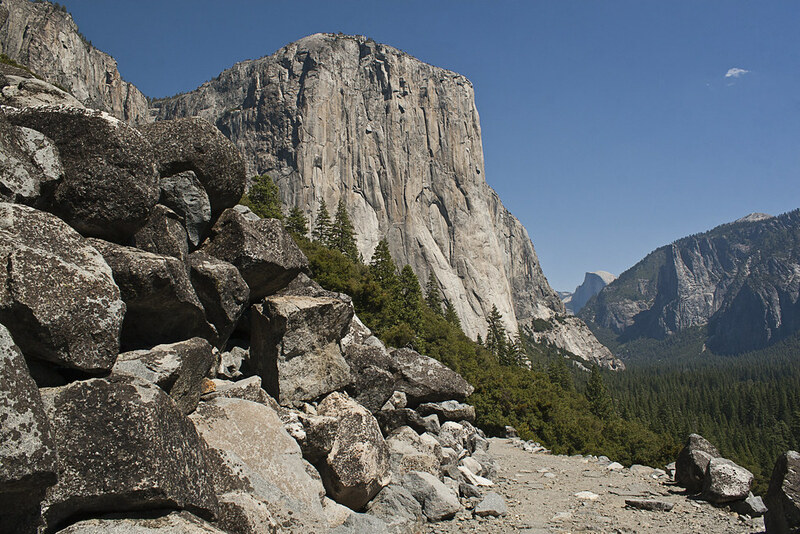 Over time, the road had been rerouted, updated, and maintained as a one-way scenic drive until a large rockslide took out the switchbacks in 1945, officially closing it forever. Since then nature has slowly reclaimed its land. Additional rockslides have continued to block more and more sections. Soil is scattered over the pavement. Trees and other plants have invaded it from the sides, slowly erasing the fact that it ever existed. For those that seek solitude, the road that no longer appears on maps, is a welcomed companion. 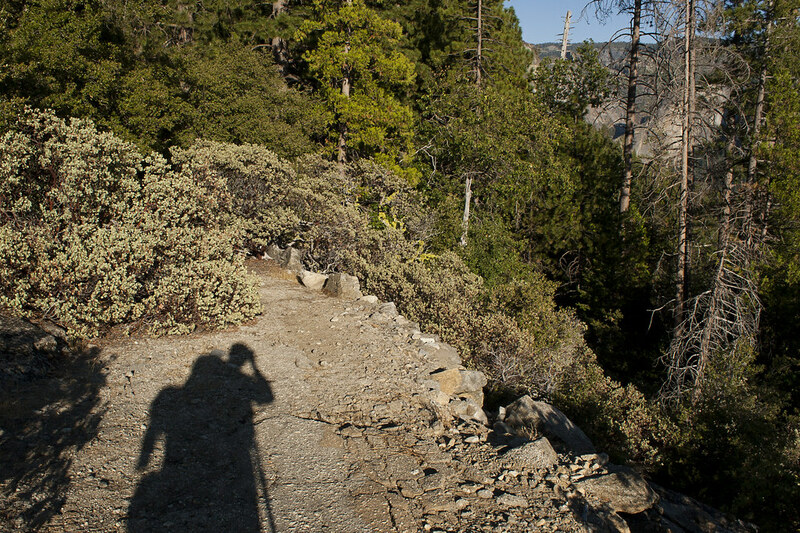 As I hiked alone up the 1,800 foot ascent to the rim, I imagined the ghosts of stagecoaches, bumping and rattling their way down the historic road, being pulled by clip-clopping horse hooves. I thought of women in feathered hats, of men in fedoras and thick wool suits; images of Teddy Roosevelt and John Muir. So then, why couldn’t I get "Rainy days and Mondays" out of my head? It’s a good idea to make noise while you hike, so you don’t startle a black bear, increasing the chance that it gets defensive and aggressive. So, to make my presence known, this became the tune I would instinctually whistle, hum, or sing when I came to a bend in the trail, or heard footsteps in the woods. Yes, I’m a true mountain man. 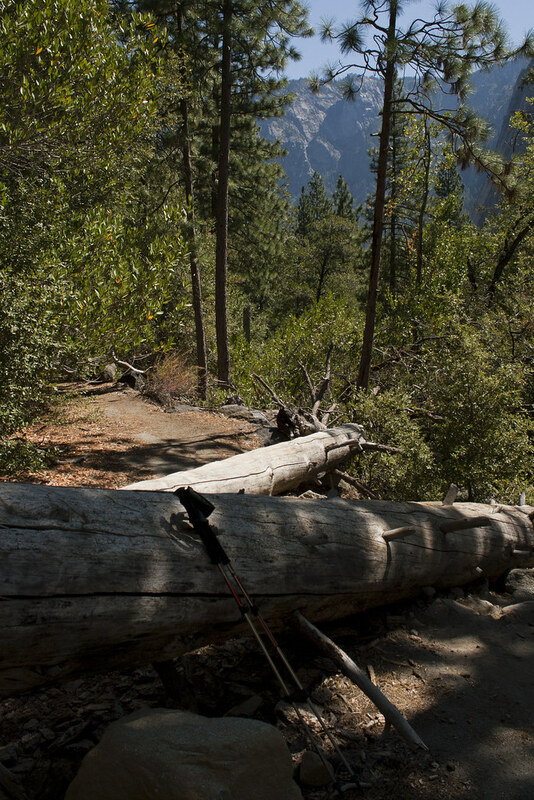 After emerging from the cover of trees, I turned to look at my first unobstructed view of Yosemite Valley. 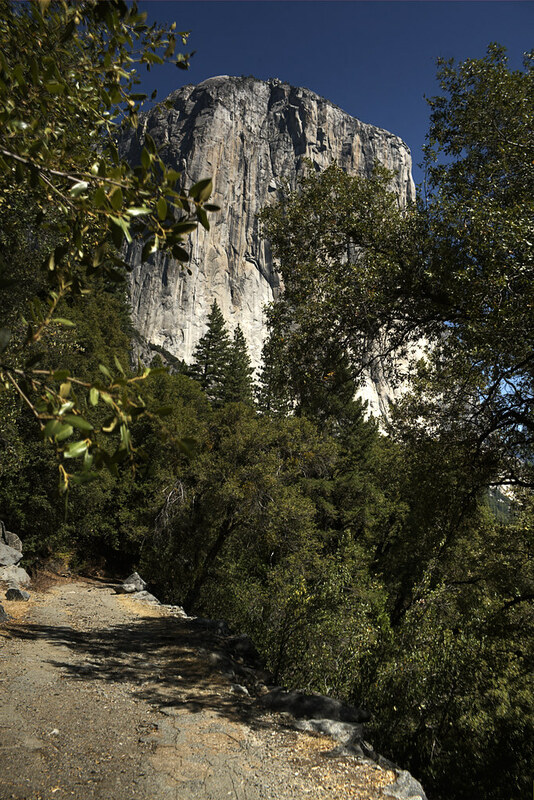 Across from El Capitan was Bridalveil Falls, an unexpected sight this late in the season. The wind wafted it into a mist before it could join the Merced River, two thousand feet below. Travelers entering the valley on the old road called the lookout, Rainbow View. When the conditions are just right, a rainbow forms in the mists. From miles away, I saw Half Dome for the first time. 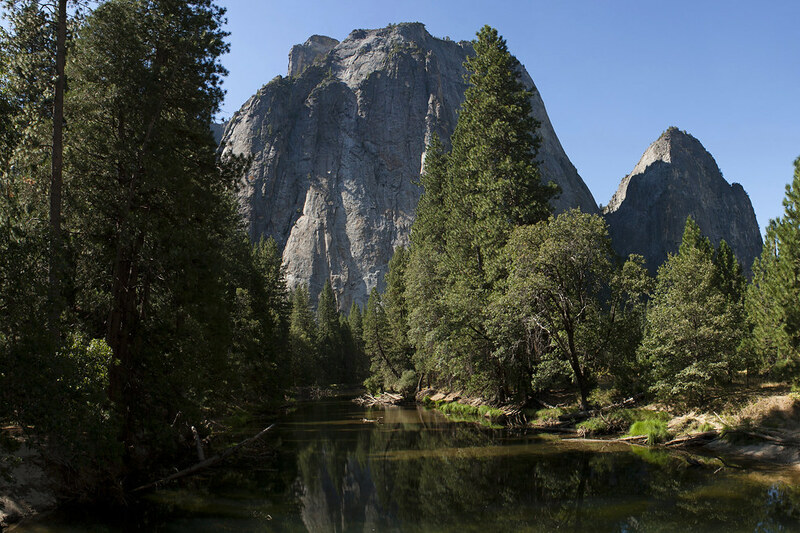 For those not familiar with Yosemite, these are iconic sights. Sights that for years I've only read about and seen in pictures. I just started laughing. I’m not sure why this was my reaction to the joy I felt, but it was. 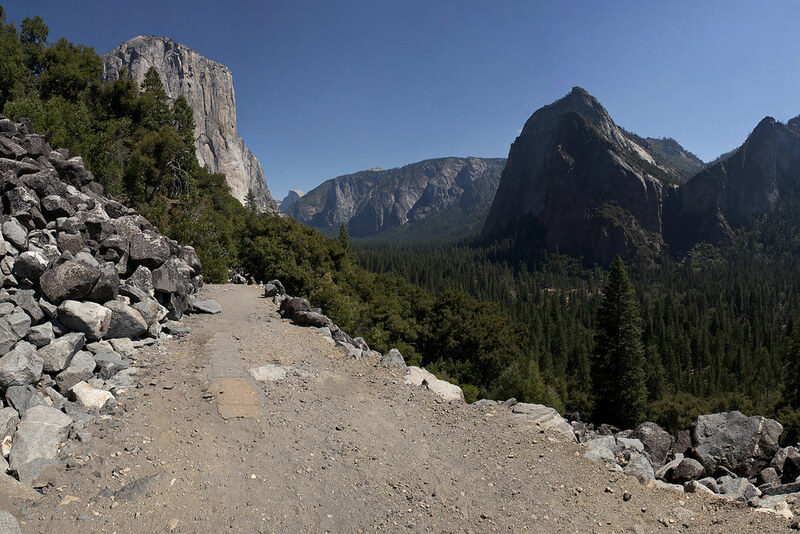 “So this is Yosemite Valley.” My eyes watered. Yep, true mountain man.